The Phantom Sun - I added it in the darkroom. See the original scan of this neg below. After publishing Part One on Monday, I had an email from a reader asking why I preferred old buildings in a run down state rather than after they had been restored and made to look nice. It got me thinking and the only answer I can come up with is a personal one. For me, once a building has been restored, it loses its link to the past. Even in a grubby, dishevelled state I still get a sense of its history. Sometimes old buildings have sad or turbulent histories and the pathos can be tangible. 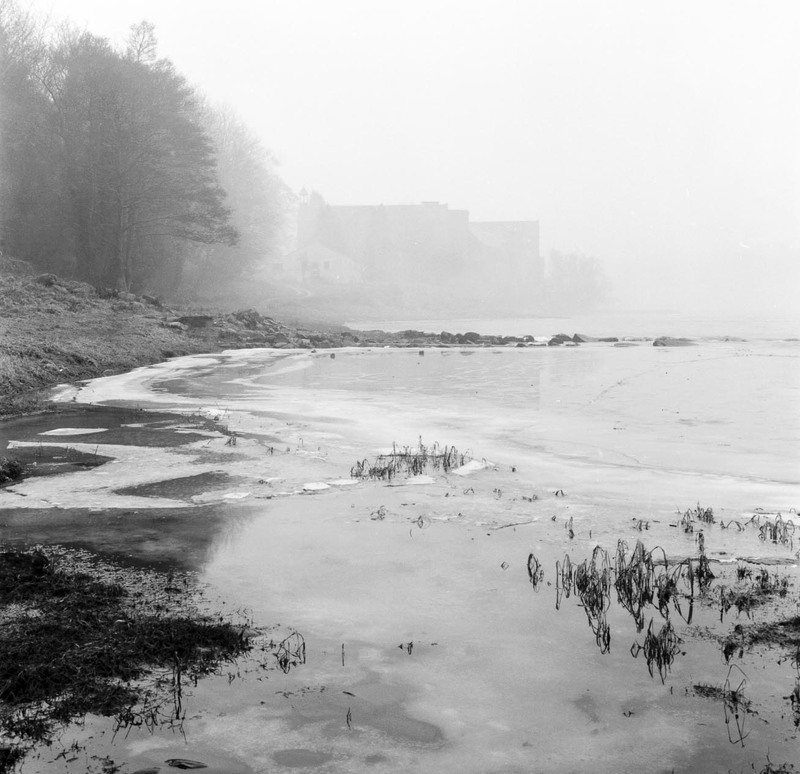 There's an old, still-inhabited castle just outside Dundee where some horrible, black deeds were done and driving past it still gives me a shiver. Murder and torture certainly took place here in Scotland's dim and distant past. Scottish historian Nigel Tranter said of it, "It is a salutary thought that some of the worst treacheries and Machiavellian intrigues to stain Scots history were probably concocted here…" In its present, reasonably well-cared for state, I can still get a feeling of its history. Hand it over to Historic Scotland, a body which seems to think that every old building has to have a nice, green, close-cropped lawn around it and ample parking, and it would assume the same character as a theme park - for me. 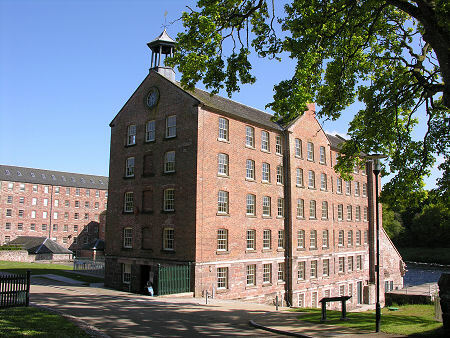 The mill as it is now. Most people prefer to see these old buildings restored and preserved for future generations, and I understand that. I'm sometimes like that with old lightweight racing bicycles, my other passion. I collect them and often find a frame in a condition not unlike Stanley Mills was when I took these photographs. There's the same dilemma. Should I leave the frame as it is showing the scars from its well-used past and providing some evidence that it was once the favourite steed of an old guy long since dead who used to race it on club runs in the 1930s? Or should I take steps to kill the rust and have the frame repainted after which it will probably be good for another 60 years - but which would leave it looking as if it has just been picked off the shelf at a local bike shop? manipulated in the darkroom to arrive at the print at the top of the post. Untouched, there's no doubt Stanley Mills would by now have been in a very dilapidated and dangerous state. I suppose I shouldn't complain: I got to see the mill complex in its unrestored condition and tourists get to enjoy a nice visitor experience without running the risk of falling through some rotten floorboards or plunging down a shaft into a vat of water. As I mentioned in Part One, the sad part is that, for people like me, the number of old buildings with this connection back through time is dwindling daily. Had I been born 25 years earlier, I would have had great fun touring the many old and historic local buildings that have either been knocked down or converted into flats. Now there are very few left. 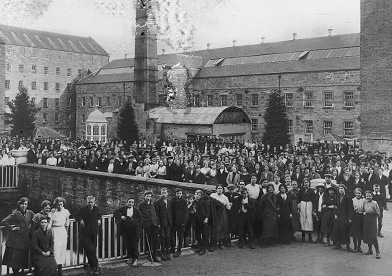 But back to Stanley Mills and my pics. The opening shot was a fun print to make under the enlarger. The straight print was OK but lacked drama so I souped it up a bit. The vertical crop is quite tight because I wanted to emphasise the foreground. The sky was quite heavily burned in which you can see when comparing the print with the straight scan above. Adding the sun was easy enough. I placed a small dot of some sort - can't remember what - on the paper during part of the sky burn-in to get a white, sun-like circle in the print. Then I used the small dot on the end of a dodging wire and moved it from the paper a few inches up towards the enlarger and down again, repeating the process during the rest of the sky burn-in to create the illusion of a halo as the sun tried to burn through the mist. 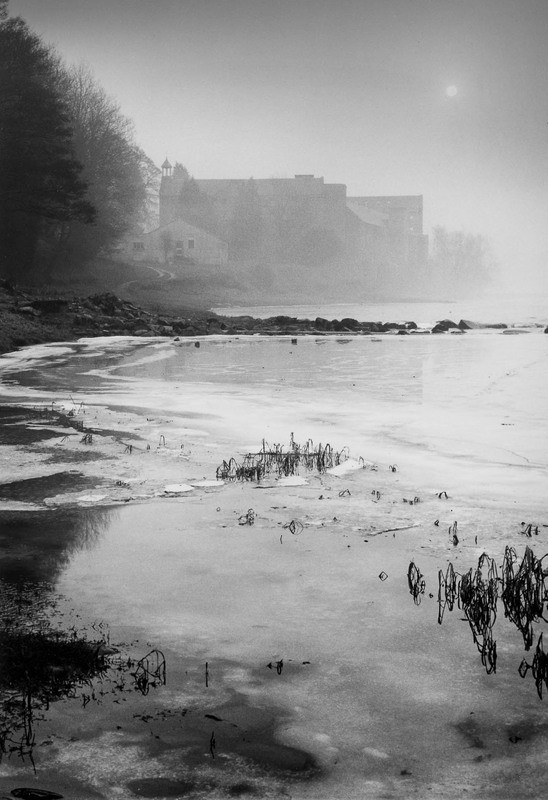 I've used this technique on a few prints in the past to add some interest to a misty sky. Is it cheating? That's a matter of opinion, I suppose. I'd have to say that it is but it's a useful tool for adding extra atmosphere to a photograph and it doesn't feel as dodgy to me as using Photoshop to achieve the same thing on a digital file. The Dinner Hall photograph is quite poignant, I think. I can just imagine the hundreds of people who would have enjoyed their mid-shift break there, looking out over the River Tay. 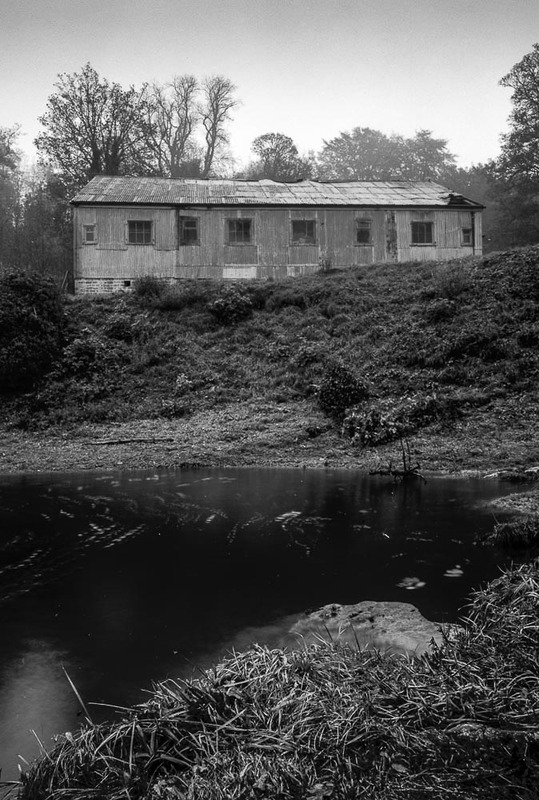 The working conditions were probably terrible for much of the mill's past but at least the views were good! Once mighty machinery probably being used now to produce knock-off Nike t-shirts on the Indian sub-continent. Jessops R100, Mamiya Press, 65mm Sekor. The mill complex must have been shut for a few years when Ken and I visited but there were still some machines dotted around. The noise inside the mill must have been deafening with all the clanking and whirring going on. I used the 65mmm Sekor on the Mamiya Press for the shot of this machine, choosing a low viewpoint to emphasise the massive bulk of this testament to the industrial revolution. 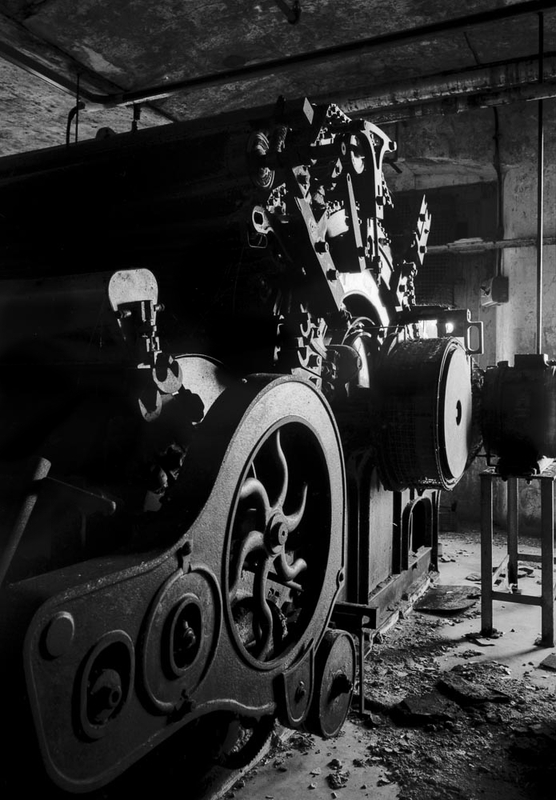 This machine was no doubt too far gone to be of much use to anyone but an awful lot of this sort of plant did find its way out to India where it was used for the same kind of work as it had been doing in Britain - but operated by people paid a pittance. 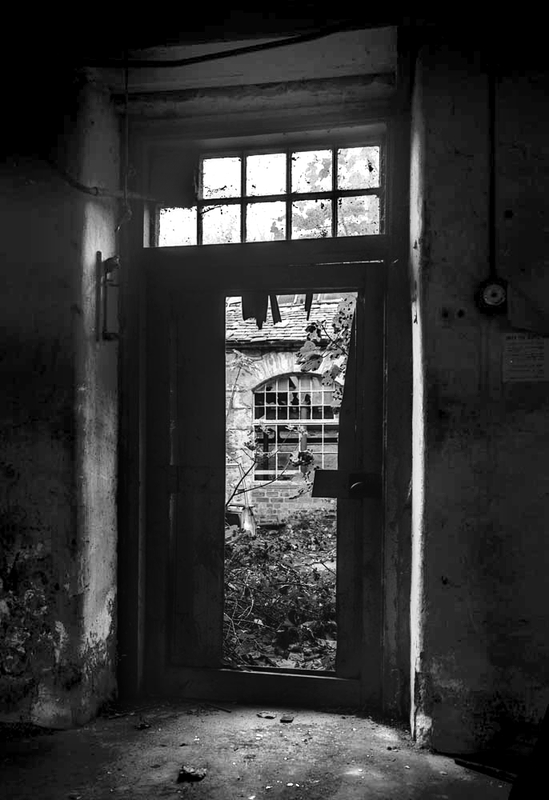 Finally, here's a shot taken inside one of the mill buildings which is also a devil to print. I've never really been happy with anything I've got from this negative. Inevitably, it's the old problem of a very dark interior and a comparatively brighter outside. Contrast on the inside walls is low so they have to be printed at a hard grade. I normally use a grade 1 filter to burn in the external world to keep the halos to a minimum. You've maybe noticed that most of these pics were taken with the Mamiya Press and 65mm Sekor. If you fancy a go at medium format then the Mamiya is an excellent tool and they can be picked up quite cheaply, as can the lenses. This was probably the period in my photographic life when I was least concerned about gear. I had a battered old Press Standard with 65mm, 90mm and 150mm lenses and my Rolleiflex 2.8F and never wanted for anything else. The Mamiya was the camera I was last using before my dalliance with digital. When I went back to film, I decided to take a different path, partly because of the weight of the Mamiya outfit but also because I fancied a change. Of course, I could have done as Don McCullin did and wandered around with just a 75mm lens on the Press which I think is what he used for many of his Somerset landscapes of a few years ago. I've got quite a few more negatives of Stanley Mills but many of them are on the thin side. It's possible to make a decent print from them but scanning the negs is a thankless task and not one I fancied revisiting. So that's Stanley Mills, a once great industrial operation reduced to the status of a housing estate. Several things Bruce . . .
Firstly, how did you manage to hold a Mam Press vertically for all those shots? Secondly, the sun looks like it is a part of the negative - well done . .it isn't easy to do well. Thirdly, you need to get yourself up some hills with some binoculars . . I'll often spy abandoned buildings from the heights . . it seems that most estates these days aren't really that bothered that a lot of their old cottages and lodges are going to rack and ruin. Again an excellent and inspiring post! I didn't hold the Mamiya vertically: the tripod did. 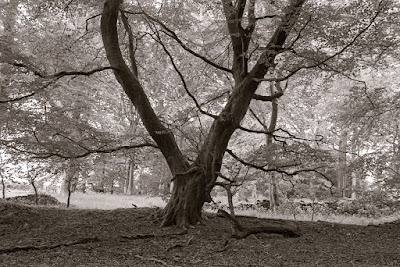 :) I always used a tripod with the Mamiya because, as you suggest, it's not the easiest camera to handhold. I think Don McCullin had the best approach. I saw a video of him out shooting landscapes and he had a fast film in the Mamiya and the camera was hanging round his neck with just the 75mm lens on it. I like your idea of scanning the estates from a hilltop. I've been on the treadmill most days for the past month trying to build up some fitness so I might try that in the summer. I thought the tripod might have helped. As for hills . . it's amazing what you see when you haven't got your gun . . . I enjoy the abandoned places but there are few around here. So it's typically as an observer of someone else's photos. I suppose if the choice is "deteriorate until it falls down or is torn down to be replaced by some soulless new building", versus being cleaned up and repurposed, I'd rather see the old places remain. But it *is* hard to do that and not lose the character of the place anyway. They might still make a pleasing subject from the outside, but they aren't what they were any more and as you say, the connection to what they were is also lost or greatly diminished. Besides, part of the attraction of abandoned places as photographic subject *is* the abandonment.